“I am alarmed by the slide of American popular culture toward things that are coarse, ugly, violent, self-directed, obscene, profane, visual, and non-rational, and by a parallel development that we might call the ‘Santa-Clausation’ of culture—the detachment of an event (the birth of Christ) or a creative endeavor (books, movies, music) from the spiritual and historical sources that give them meaning. It is no accident, I think, that we find these two developments side-by-side at this point in history. To return to your place in the main text, simply press your browser’s back button (or arrow). 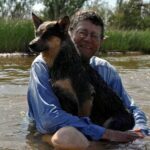 To access (from its beginning) the profile of “Hank the Cowdog” creator John R. Erickson, go here.